CUSTOM ORDER available from Asia. Please note it takes 10-12 working days with normal registered mail. If you wish to opt faster delivery at additional cost, please kindly inform us. What is BUSY BOOK ? We encourage parents to work together with your children as you guide them though the activities, but at the same time let them develop their independency. .
Busy Book is a learning tool to keep your little ones busy and at the same time entertained while they learn about shapes, colours, textures and a lot more. Bring along Busy Book when you travel, at the back seat of the car 🚗 , or anytime when you need your little ones to stay quiet and busy. 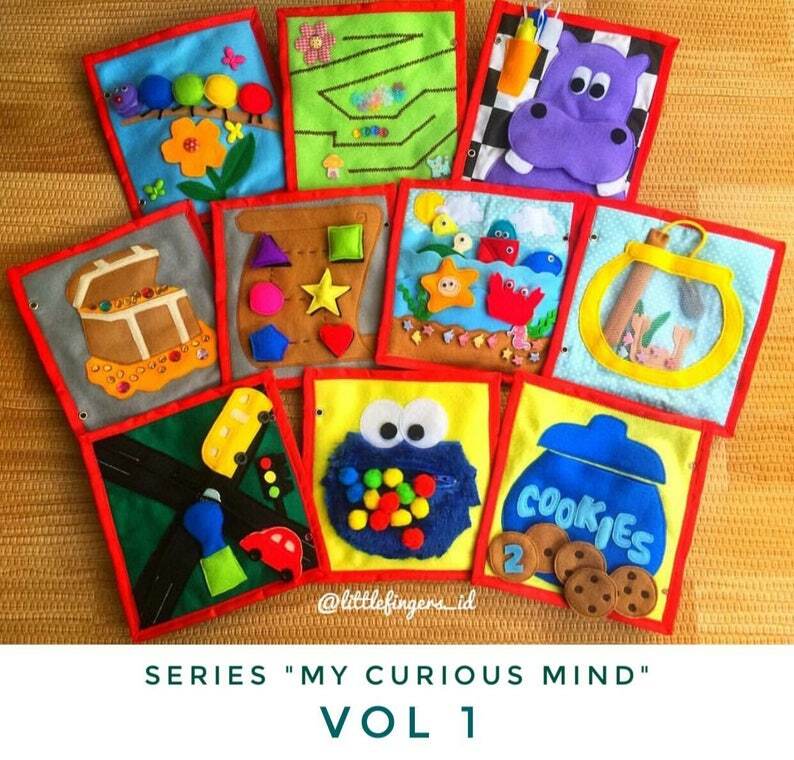 This activities in this book are carefully designed by a child psychologist, where every page has a specific purpose and stimulation for developing children sensory and senses. Full of bright colors and various texture, hoping that all the children may grow their love for books and less expposure of gadgets and TV. This makes a great gift too for family & friends. For custom name and cover page, please allow 1-2 weeks for delivery preparation as this is Hand made book that requires a lot of details. Shipping is expensive but I like the quality and hope my daughter will like it. What a beautiful book for little people with busy hands! Very well made. This is our second order of this book. The first was for our son for his first Christmas and he has loved it so much we bought it as a 2nd Birthday gift for our nephew. It was a hit with the adults as well. Always very responsive and well made.